You've Always Had the Power! One of my favorite movies growing up was "The Wizard of Oz". I always admired the courage and determination of Dorothy. I also loved how she went in search of something better only to find there is nothing better than what she left at home. I always loved my home and family and knew that home is where I was happiest. As I was recently watching the movie again, I realized there was something more to be learned from it. In the end the wizard accidentally leaves without Dorothy. Glinda the Good Witch comes and is asked how she can help Dorothy get home. She says, "You don't need to be helped any longer. You've always had the power to go back to Kansas." Dorothy is shocked and the scarecrow asks why Glinda didn't tell Dorothy before. "Because she wouldn't have believed me. She had to learn it for herself." "You've always had the power!" The same is true for us. We have always had the power inside of us to be great. To be BRILLIANT! To accomplish our dreams! And just as Dorothy got to learn it for herself, we get to learn this truth for ourselves. When we make this discovery, we can do anything! So what is it that holds us back from discovering our brilliance? fear. Each of us has our own fears that hold us back from being the amazing brilliant beings we were meant to be. Think about that for a moment....What fears are hold you back? Stop reading right now and go find a pen and a journal or notebook to write in....I'll wait.....No really go get something to write on! Got them? Great! Now here's your challenge for today: Write down that one thing you've been putting off doing out of fear. Now comes the most important part. Write down your honest fear. I am afraid of _______ because_____________. Be honest. Be real. Write it out. Let the fear wash over you. Feel it. Fear won't kill you. Okay? It's not angry grizzly bear. It's a teacher. It will teach you some amazing things if you allow it to. You get to decide what to do with it. You hold the reins and can steer your life in any direction you choose. YOU HAVE THE POWER! So, write down what you've been putting off because of fear, then write down three teeny tiny action steps that you can do to get started....the DO THEM! If you want to change, choose it! Make the call, love, dive in, forgive, get it all. Make the decision! Life is too short! Don't lose out on having the life you have dreamed of because of fear! I worked hard facing a lot of fear this week. Honestly, I've been facing a lot of fear starting this blog and writing these posts this week! With lots of prayer and putting one foot in front of the other I've done it and I'm not about to stop! Thank you to all of you who have been encouraging me in this great adventure! This life is too short to not reach your full potential and live your best life ever! Fill in this sentence right now: My life is too short to/not to ____________. Act on your fears! Tiny actions lead to Big results. Dive in and give it all you've got. 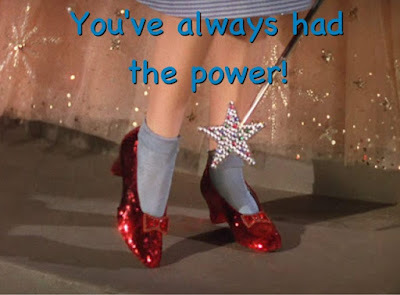 And remember YOU'VE ALWAYS HAD THE POWER! P.S. Comment and let us know what you're working on! In each of our lives we have a well travelled path, paved with beliefs formed from experiences in our life. For many of us we trudge on, staying with what we know and feel safe with, all the while feeling like life is beating us down. Like horrible things always happen to us. We know our lives need to change. We just don't know how to go about changing them. Someone flowed into my life and showed me a different path. This path was less travelled. It appeared dangerous and difficult. Others told me it would be worth taking, but it meant getting off the road that was safe and comfortable. It meant being willing to shift my limiting beliefs and allowing myself to stop hiding in the shadows and discover who I truly was, who my Heavenly Father created me to be. I did it. I chose the path less travelled and it truly has made all the difference in my life! I discovered a greatness inside myself. A power that I had always had! When I finally let it out to shine, my life became cosmically bright and full of unending love and happiness! It was my SOULFUL BRILLIANCE!! As I live my soulful brilliance each and every day, it is my desire for you also to discover your soulful brilliance and to live the life of love and happiness you've always dreamed of! I've created this website to be a place where you can come to find small nuggets of wisdom myself and others have discovered on our journeys of discovering our soulful brilliance. My challenge to you today is to make that choice! Choose to change your life and discover your less travelled path. I know it will make all the difference!